LIC Jeevan Tarun Features and Benefits : LIC’s Jeevan Tarun Plan is a Traditional Money Back Plan with Limited Payment Option. This is one of the most flexible Money Back Plans in LIC as it has 4 Survival Benefit options and thus the Maturity Benefit also changes accordingly. The Plan continues for a minimum period of 13 years to a maximum of 25 years. This plan terminates after the Life Insured, i.e. the child is 25 years old. 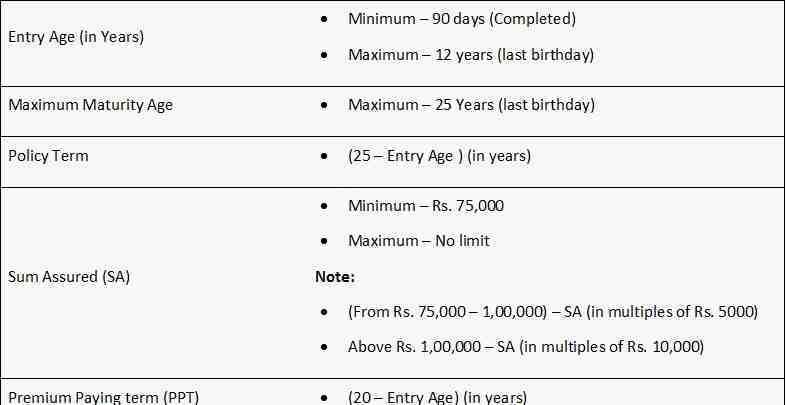 In this plan, if the Life Insured dies within the policy tenure, the Sum Assured of Death + vested Simple Reversionary Bonus + Final Addition Bonus, if any would be payable to the nominee as Death Benefit and the policy terminates. The Sum Assured on Death has been defined as the higher of 10 times the Annualized Premium or 125% of the Sum Assured, whichever is higher, subject to a minimum of 105% of total premium paid till date. LIC’s Premium Waiver Benefit Rider: This rider can be taken at the policy inception or anytime later except the last 5 policy years. In this rider, if the proposer, i.e. the parent dies within the policy tenure, the premiums are waived off but the policy continues and pays as per schedule so that the planned expenses for the child’s education is not hampered. The minimum coverage provided in this plan is 10 times the Annualized Premium paid so that the Maturity Benefit is tax efficient. Be the first to comment on "LIC Jeevan Tarun Features and Benefits"